His co-driver stopped counting at five rolls. 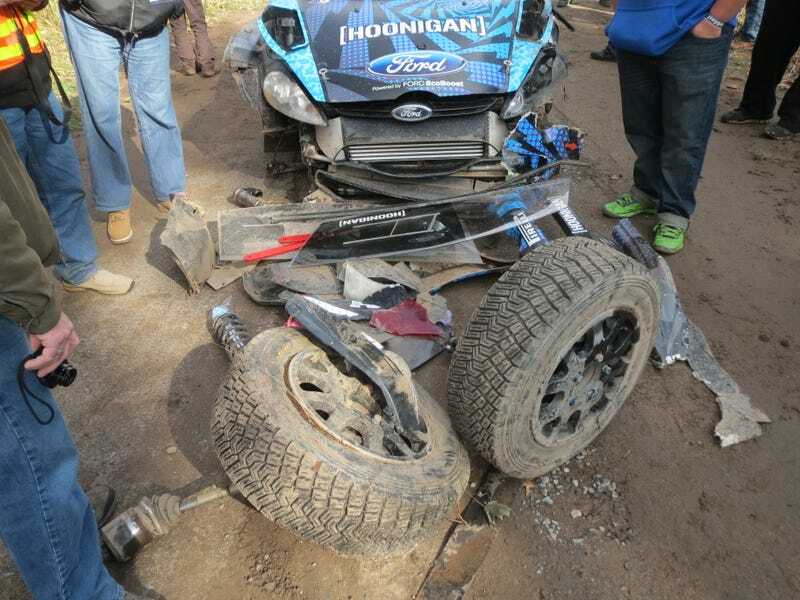 No one is sure how many times Ken Block rolled his rally car, but this massive crash is how he ended his Rally America season, and his shot at winning the championship. These excellent pictures come from reader thoushalthoonthyrallyetires, who was at the final rally of the Rally America season, the Lake Superior Performance Rally in Michigan. And he was there after Block crashed. How did the wreck happen? Well, thoushalthoonthyrallyetires points out this was a 100 mile an hour, sixth gear turn and Block slid into the ditch, clipped the embankment, and went flying. Block admits that he didn't mark the tightening corner correctly in his pace notes. Unbelievably, Block was perfectly ok and his codriver Alex Gelsomino made it out with only a minor concussion. You need to see the rest of thoushalthoonthyrallyetires' pictures of the balled-up wreckage, as well as his first-hand account of the scene, so go right here to see 'em.